As an addition to my last post, a little research has found HMS Ferret of six guns, a cutter built at the Chatham Royal Dockyard and launched in 1763. Her building cost was £1,006.17s.3d. Her sister-ship HMS Lurcher was built at the Deptford Royal Dockyard and her total cost was £1,603.18s. Allowing for inflation in the 43 years between those two and the Cheerful Class and the fact that the two Cheerful Class vessels were quite a bit bigger (13 feet longer at the main deck and double the number of guns), I'd say that my guess of about £3,000 wouldn't be too far off the mark. 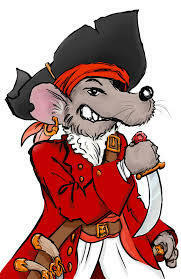 I've said on many occasions, a man pressed into Naval service aboard a successful vessel could be paid off at the end of her commission and be relatively wealthy, with his share of prize and head money together with his wages, assuming he survived. Prize and head money could sometimes take years to come through, which is why the announcements in The Gazette are a good source of information about captures made by Royal Navy vessels. As for the cost of vessels like these two, I would have to have a look at their Progress Books at the National Archive to find out. It's not shown in British Warships in the Age of Sail. Using that as a reference is a bit hit and miss, sometimes the building and fitting costs are listed, other times they're not. As a guess, I'd say a building and fitting cost of about £3000 - £4000 in 1806 money wouldn't be too far off. Bilgerat. Again, a most interesting story of two ships. Amazing how active they were, prize money must have far exceeded their final sale price; about how much would they have cost new please? The Cheerful Class was a pair of Topsail Cutters built at James and Joseph Johnson's shipyard in Dover. They were unusual in the way that they were acquired by the Royal Navy. Topsail Cutters like HMS Cheerful and HMS Surly were usually either bought off the stocks from the building yard by the Navy Board or were hired on a bareboat charter basis, where the vessel remained in private ownership but the Royal Navy put their own officers and crew into her. The Cheerful Class of Topsail Cutters were designed by Sir John Henslow, Co-Surveyor of the Navy and their construction was put out to tender by the Navy Board. Topsail Cutters were fast, manoeuvrable and seaworthy. Their small size meant that they could operate close inshore and their speed and manoeuvrability mean that they could outsail pretty much anything. Their seaworthiness meant that they could make surprisingly long voyages for vessels of their size. 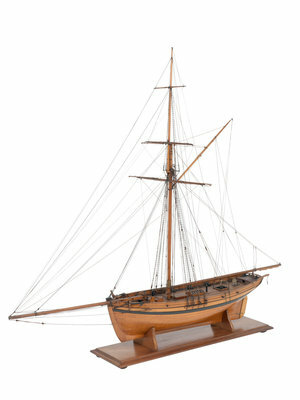 A couple of examples of this are the Hired Armed Cutter Rattler, which was part of Lord Howe's fleet at the Battle of the Glorious First of June which was fought in mid-Atlantic and HMS Entreprenante, which was part of Lord Nelson's fleet at the Battle of Trafalgar, fought off the Spanish coast not far from Gibraltar. 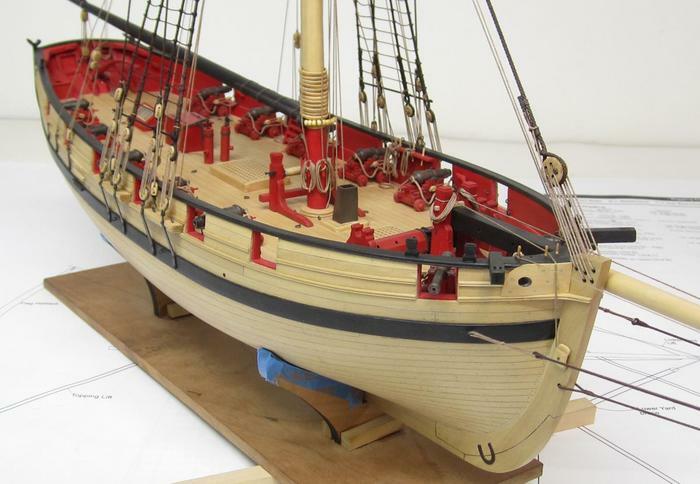 They were the vessel of choice for the many privateers of all sides in the French Wars operating in European waters as well as smugglers and the revenue authorities trying to catch them. James and Joseph Johnson won the contract to build the pair and contracts were signed on the 29th March 1806. Both vessels were laid down in June of 1806 and were launched a few days apart in the November. 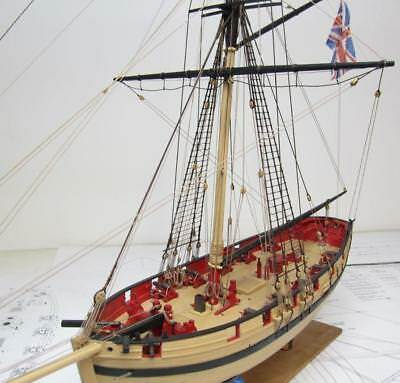 After their launch at Dover, both vessels were taken to the Royal Dockyard at Sheerness to be fitted with guns, their single mast and their rigging. On completion, HMS Cheerful and HMS Surly were vessels of 137 tons. They were 63ft long on their main decks and 46ft 9in long along the keels. They were 23ft 6in wide across their beams. They were armed with 10 x 12pdr carronades on their broadsides and 2 x 4pdr long guns in their bows. They were manned by a crew of 50 officers, men and boys. The commanding officer with the rank of Lieutenant in the position of Lieutenant-in-Command was the only commissioned officer aboard and he was assisted by a Second Master in charge of the day-to-day sailing and navigation, a senior Boatswains Mate to look after the masts, rigging and boats with a Sailmaker to maintain and repair the sails and flags. A Quartermaster was appointed to oversee the vessel's steering and the positions of Purser and Clerk were combined in the role of the Clerk in Charge. In his day-to-day command responsibilities, the Lieutenant-in-Command was assisted by a senior Midshipman. the 29th August because on that date, HMS Cheerful in company with the hired armed ship Humber of 16 guns, the 32pdr carronade-armed brig sloop HMS Recruit (18) and the gunboat HMS Experiment of 2 guns captured the Dutch vessels Diamond and Karen Louisa. On the 2nd September, HMS Cheerful captured the ships Raskaboude and Sophia Amelia for which a huge amount of prize money was paid. Lieutenant Carpenter's share alone was worth £328.5s.5d. During 1809, HMS Cheerful was operating in the Baltic Sea, implementing a blockade of the Danish coastline. Between the 11th and 17th November 1809, HMS Cheerful in company with various other vessels captured the enemy vessels Maria Charlotte de Friede, Der Von Nagler, Catherine Elizabeth, Trendre Brodre, Haabet, Anna Helena and Neptune. Between 26th and 27th May 1810, by now under the command of Lieutenant George Wood, HMS Cheerful and her crew took the Soefuglen and three open herring boats. On the 25th June 1810, HMS Cheerful took the Swedish brig Charlotte Caroline. On the 4th August 1810, HMS Cheerful captured the Swedish sloop Lyeden. The following day, HMS Cheerful was in company with the hired armed cutter Hero of 8 guns when they captured the Catherine of Wismar. By June 17th 1816, HMS Cheerful was one of a number of vessels laying off the Deptford Royal Dockyard being offered for sale. On the 31st July 1816, she was sold for £350. On the 23rd November 1806, HMS Surly began fitting out at Sheerness and commissioned for the Channel under Lieutenant Peter Crawford in January of 1807. She was declared complete on the 4th May. On the 10th April 1810, HMS Surly was in company with the 18pdr carronade-armed gun-brigs HMS Firm and HMS Sharpshooter (both of 12 guns) when they captured the French privateer Alcide off Granville. On the 22nd November 1813, HMS Surly in company with the 32pdr carronade-armed brig sloop HMS Scylla of 18 guns and the hired armed ship Sea Lark recaptured the ship Harmony. The Napoleonic War was ended in April 1814 and on the 12th June, HMS Surly departed Portsmouth with a convoy bound for Cherbourg in order to bring back 12,000 Russian troops, returning to Portsmouth on the 20th. Despite the end of the war, HMS Surly remained in service and on the 4th January 1820, brought back to North Shields part of the merchant vessel Lady Sherbrook's cargo. That ship had gone aground on the Herd Sand and had been wrecked. On the 27th November 1821, HMS Surly was reported as still being in commission, operating out of Chatham and Sheerness. 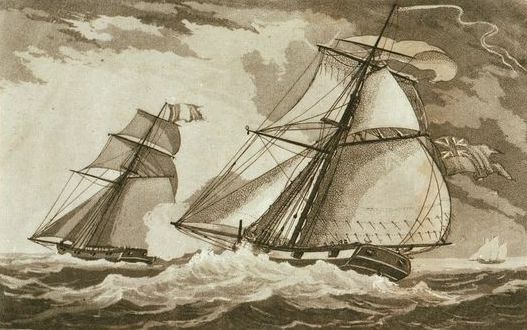 On the 12th May 1828, HMS Surly rescued a seaman, James Elphinstone from the Thames Estuary. He had been loading a signal gun aboard the East Indiaman Lady MacNaughton when the gun had gone off the instant he finished loading it. Blown overboard, his right arm had been completely shattered and was bleedingp profusely. Bleeding to death in the water, his plight was spotted by the Indiaman's Third Mate, Mr Hopkin Eustace, who dived into the water to rescue him. The two men had been in the water for about 15 minutes when they were spotted by lookouts aboard the anchored HMS Surly, which sent a boat to pluck them both from the freezing water. In February 1832, HMS Surly was taken into the Royal Dockyard at Chatham to be converted into a lighter. She remained in that role until January 1837, when she was sold at Chatham to Mr Rahn for £400.